Stephen B. Wicker is a Professor of Electrical and Computer Engineering at Cornell University, and a member of the graduate fields of Information Science and Computer Science. He teaches and conducts research in wireless and wired information networks, privacy-aware design, computer security, and digital telephony. Vijay K. Bhargava is the editor of Reed-Solomon Codes and Their Applications, published by Wiley. An Introduction to Reed-Solomon Codes (S. Wicker and V. Bhargava). 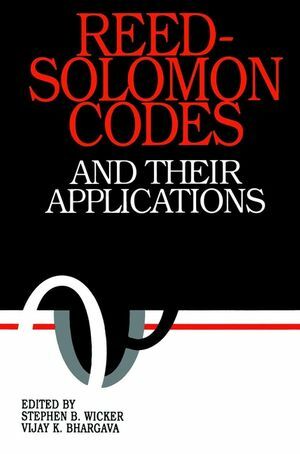 Reed-Solomon Codes: A Historical Overview (I. Reed and G. Solomon). Reed-Solomon Codes and the Exploration of the Solar System (R. McEliece and L. Swanson). Reed-Solomon Codes and the Compact Disc (K. Immink). Algorithms and Architectures for the Design of a VLSI Reed-Solomon Codes (A. Hasan, et al.). Soft Decision Deconding of Reed-Solomon Codes (A. Cooper, III). Reed-Solomon Codes in Hybrid Automatic Repeat-Request Protocols (S. Wicker and M. Bartz). Reed-Solomon Codes in Frequency-Hop Communications (M. Pursley). Reed-Solomon Codes and the Design of Sequences for Spread-Spectrum Multiple-Access Communications (D. Sarwate). A Hypersystolic Reed-Solomon Decoder (E. Berlekamp, et al.). Matching Viterbi Decoders and Reed-Solomon Decoders in a Concatenated System (J. Hagenauer, et al.). RS-Based Unidirectional Byte Error-Control Codes Perform Better Than RS Codes (Y. Saitoh and H. Imai). Reed-Solomon and Algebraic Geometry Codes (T. Yaghoobian and I. Blake).